Since tons of people five have requested a gift guide this year, I thought I'd give it a whirl. I too get tired of the "for him for her" gift guides I find in every paper and magazine that all suggest buying my brother a marshmellow shooter or my husband R2D2 salt and pepper shakers (although they would probably both like those items. Moving on). 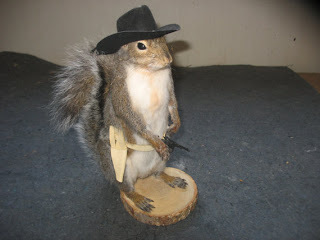 I haven’t posted a blog in so long I almost forgot how (for realsies). And honestly, I wasn’t even sure I was up for, or into doing a holiday guide this year…that is, until I saw this little ditty. 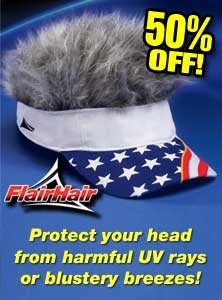 The Haband Flare Hair Visor. The product description says, “Wait for the laughs at your next golf outing, family reunion or trip to the beach.” I would have to add, “and keep on waiting, because those laughs ain’t comin’ son.” But why let that stop you? (I'm willing to bet that for the type of person who would wear this hat, it hasn't before.) Expect this baby to make an appearance at office holiday parties across the nation. A perfect gift for: Your uncle who manages a small banking branch, regularly shops for Christmas gifts at Spencer’s, owns the complete collection of Walker Texas Ranger on DVD, and still wears his “I’m with stupid T-shirt” on casual Fridays for back slapping laughs with his employees. 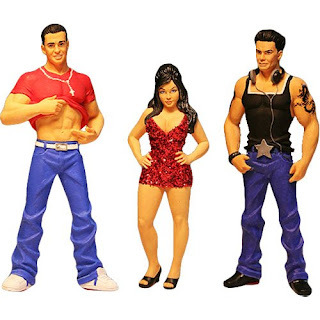 When I think of Christmas, I think of softly falling snow, baking cookies, Santa's elves and also, um, the cast of Jersey Shore? Full disclosure, I haven’t seen more of the show than what’s shown in clips on Talk Soup, but how these people ended up as a cultural phenomenon is beyond my mental grasp. I guess it’s related to our human need to crane our necks for a car wreck or watch disturbing footage of plane crashes over and over again on the news. Perfect gift for: That someone on your list who not only feels the need to watch the car wreck, but also decorate their Christmas tree with it. Do you have a special lady in your life? If you would like that special lady to smell like cooked flesh, your quest for the perfect gift has ended. Introducing Bacon by Farginnay, a propietary blend of 11 essential oils (grease and fat being at least two of those and is there anything the ladies love more than grease and fat? No. No there really isn't.) This gives treating women like pieces of meat a whole new meaning. Perfect gift for: The ladies (the ones who like to smell like meat). 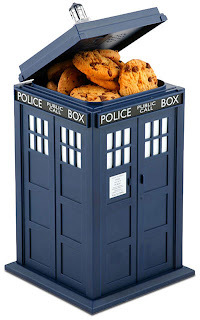 The best thing about this cookie jar, in case you didn’t already know, is that due to ancient Timelord technology, the cookie jar is BIGGER on the inside. So this guy could hold enough cookies to fill the entire Gamma Quadrant (wait, I’m mixing my nerdy sci-fi references). No matter, allons-y and get your wallet! Perfect gift for: The sci-fi cookie lover on your list. In other words, my husband, who actually could eat a planet worth of cookies and still be skinny with low cholesterol. The Thomas Kincaid lover in your life most likely cannot get enough Thomas Kincaid. These people are going to want glowing cozy cottages painted on their windows, mugs, chair cushions, shower heads, underwear and possibly tattooed on their lower back. This figurine quenches (some) thirst for Kincaid’s work. 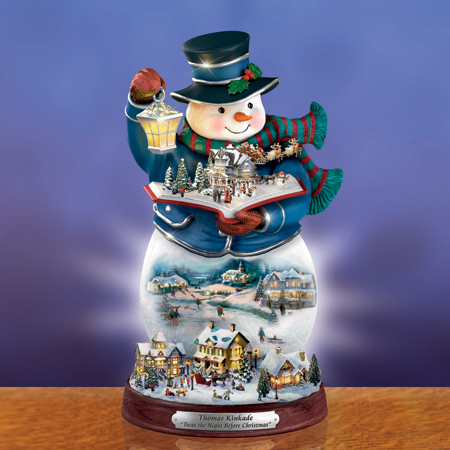 This friendly Frosty reads a tale of snuggly Christmas cheer, while digesting the Yule Town he ate for breakfast and standing in the glowy christmas village he crapped out after lunch. If you look closely into the fireplace lit houses in Frosty's bowels you will find itty bitty Kincaid mugs and prints for sale in the cozy village market. A perfect gift for: Everyone. Anyone who wouldn’t love this gift hates Christmas, coziness and Jesus. I would be horribly remiss if I didn't include a little Will and Kate memorabilia for the 2011 list. 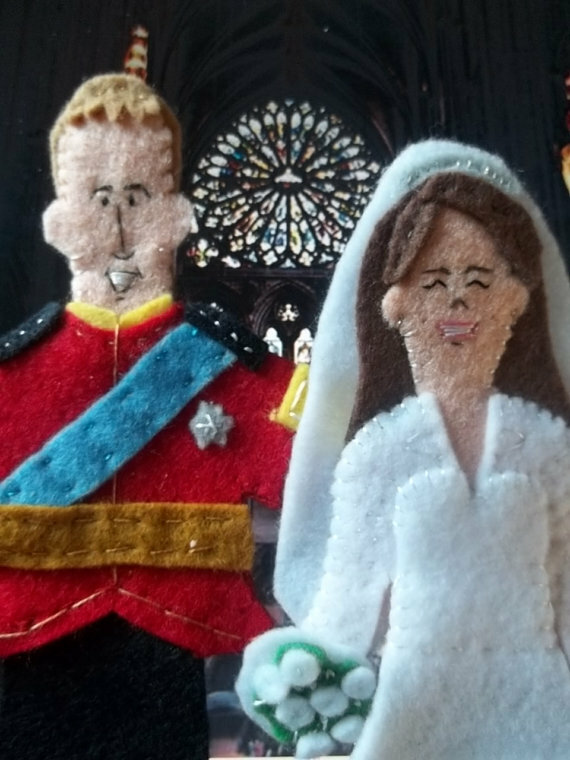 Enter Will and Kate (the finger puppets) available on etsy. With these collectible Mullish Muse puppets you can relive over and over again the morning you got up at 4:30 am to watch a young lady walk into a church a commoner and leave a princess. (or at least the time you checked out the footage on youtube and flipped through the commemorative edition of People in the grocery store line.) Also available, Jay-Z, Hunter S. Thompson and Edgar Allen Poe. Think of the Royal reception scene you could put together! Perfect gift for: The person who is really popular around the office for their collection of smurf pencil toppers and vintage troll dolls. Would I leave you without a fake baby primate? Would I? Of course not. It's Christmas after all! 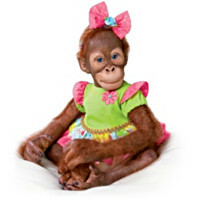 Meet Mollie, the first ever orangutan toddler doll from the Ashton-Drake galleries. According to the website, this collectible toddler doll features a "soft, huggable and poseable body that you won't be able to resist picking up." The gift recipient may also not be able to resist taking her to play dates and library story time but I would strongly discourage that. These babies tend to want to roll around in their own feces. A perfect gift for: Your friend who's always wanted an orangutan baby. Happy shopping to all and to all a good night!